The April round of the State Street global investor confidence indexes showed institutional investors appear to be growing more confident on the outlook for risky assets. The regional indexes showed this uptick in risk appetite has been widespread across the major regions. It appears as though institutional investors are looking through much of the “noise”, and focusing on the reset in sentiment and valuations against the backdrop of decent earnings and economics. With this group of investors controlling large sums of money it will be interesting to see if this increased confidence translates into higher stock prices. -Global institutional investors are increasing allocations to risky assets. -The uptick in investor confidence is widespread across the major regions. -The investor confidence indexes are quantitative indicators, and take account of actual changes in allocations across State Street’s $30 trillion global custodian business. -As the Euphoriameter shows, there has been a reset in ‘investor euphoria’ driven by lower valuations, higher volatility, and less bullishness in the surveys. 1. 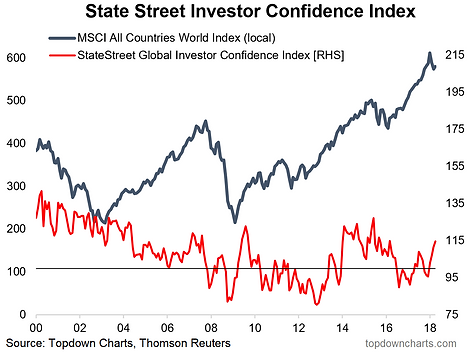 Global Institutional investor Confidence Index: The April reading of the State Street global investor confidence index showed a further rise, +3pts to 114.5, which is the strongest reading since March 2016 – which coincidentally was just after a substantial stock market correction. Basically institutional investors are feeling fairly confident on the outlook for risky assets, and appear to be looking through the noise (trade wars, geopolitics, etc) and focusing on the reset in valuations, decent earnings results, and solid global macro pulse. A question I always enjoy hearing in the context of markets is, “Have I missed it?” That simple question betrays everything about the questioner’s assumptions and about the balance of fear and greed. It is a question which, normally, can be answered “no” almost without any thought to the situation, if the questioner is a ‘normal’ investor (that is, not a natural contrarian, of which there are few). That is because if you are asking the question, it means you are far more concerned with missing the bus than you are concerned about the bus missing you. It usually means you are chasing returns and are not terribly concerned about the risks; that, in turn – keeping in mind our assumption that you are not naturally contrary to the market’s animal spirits, so we can reasonably aggregate your impulses – means that the market move or correction is probably underappreciated and you are likely to have more “chances” before the greed/fear balance is restored. This article looks at a couple of key trends in asset allocation. We look at the evolution of investor portfolio allocations to stocks, bonds, and cash both across time, and more recently. Importantly, we look at how it ties into the valuation picture against the backdrop of a coming full circle in the global monetary policy experiment. It seems for investors a brave new world is upon us as we move into a more challenging phase of the cycle. -Cash allocations are at almost 20-year lows, which is typically something you see later in the cycle. -Equity allocations have drifted up at the expensive of cash and bond allocations. -From the 80’s to the 90’s we saw what looks like a structural shift in portfolio allocations. -With the major asset classes all looking expensive, and central banks moving into quantitative tightening, it’s a brave new world for asset allocators. 1. Cash Allocations: As regular readers will know, I’ve talked about this chart a lot and I think it does capture a few key issues. It also serves to highlight or contrast with the rest of the charts in this article, particularly the one on valuations at the end. 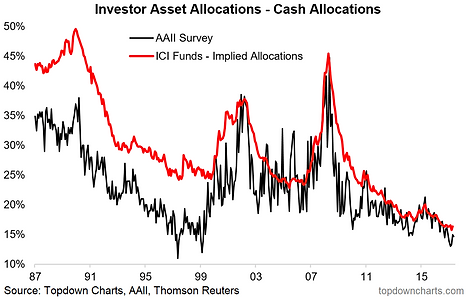 Firstly, for clarity the chart shows surveyed cash allocations across individualinvestors in America (the AAII survey), and implied allocations (derived from ICI mutual fund statistics). They both say basically the same thing – that cash allocations are near record lows, certainly at a cycle low. Investors have been both drifted out of cash (drift = changes in asset allocation driven by market movement), and basically bullied out of cash by central banks. And as I implied, there is a cyclical element to it – this is usually the type of condition you’d see toward the later stages of the market cycle. -Equity “fundamentals” sentiment is still holding up, and now “technicals” sentiment is starting to rebound from deep pessimism. -Bond market sentiment has seen at least a partial reset both on surveyed sentiment and broader market sentiment. -The solid readings in the ‘nominal surprise index’ and earnings revisions momentum line up with the optimistic view on the fundamentals outlook, and remains a key swing factor on the overall risk outlook. 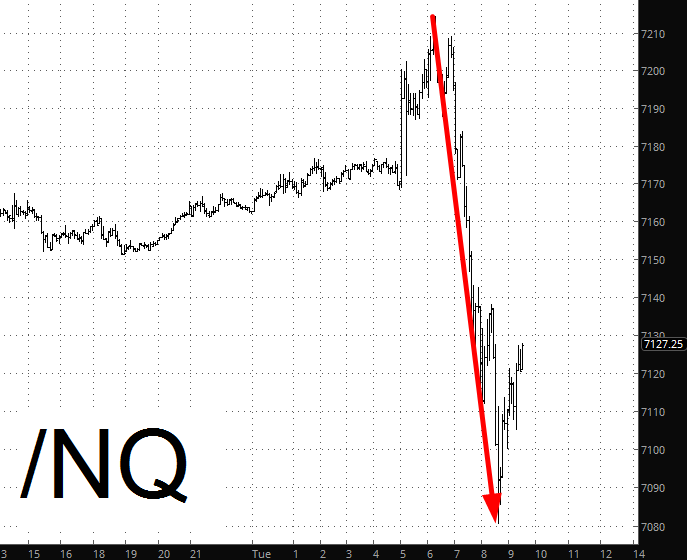 So yesterday market participants were instigated by the media to get hysterical about interest rates. I saw a prominent headline talking about how a market expert (whose name escapes me) forecast that when 10yr yields go through 3% stocks are going to go down big. If you click the headline they will tell you all you need to know, and way more than you need to know as a rational and calm market participant. Meanwhile, the Continuum had indicated that a caution point was at hand long ago. At first glance, it would seem the swift swoon on the NASDAQ was kind of a big deal, since it’s been such an unstoppable monster lately. But in the grand scheme of things, it’s nothing. Unless we break 7000, the bulls are large and in charge. For anyone who has been looking at the detail across sectors, factors, and styles in global equities, there have been a couple of peculiar and extreme standouts. Relative performance across a select few factors and styles seem to have accounted for much of the new bull market in global equities, and what’s interesting is, the February correction did little-to-nothing to change this stark trend. The chart comes from a recent edition of the Weekly Macro Themes report, which looked in detail at relativities in global equities, and how the extremes may resolve. 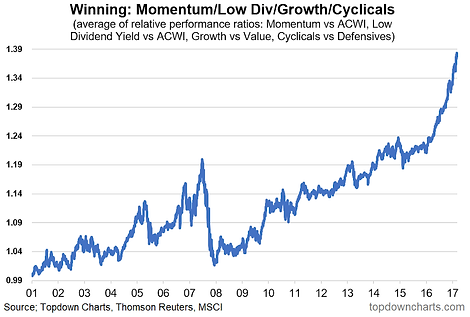 The chart in question shows the average relative performance across momentum, low dividend yield, growth vs value, and cyclicals vs defensives. The line in the chart is a simple average of the aforementioned styles and sectors. So basically, it’s high growth, high momentum, low dividend yielding, cyclical stocks that have performed the best, and been the major drivers of the global equity bull market. The growth/cyclicals aspect probably makes a degree of sense, given how widespread and substantial the acceleration in global growth has been. But even so, the performance since early 2017 has been simply extreme. When you see extremes in markets you ought to pay attention. If there’s a rule of thumb that stands the test of time in markets, it’s that extremes don’t last. Indeed, often times extremes can unwind faster and further than you expect. I would say there has probably been substantial flows chasing these styles and sectors too and that his remains a key vulnerability for stocks, and a potential nasty surprise for those who jumped on the bandwagon.